In early August Congress passed and President Obama signed into law a measure to reduce the interest rate on new government-backed student loans. A previous rate-setting law had expired, and rates were set to double, which would have cost the average college student borrower an additional $4,500. The fix only affects interest rates in the short run, however, and does nothing to address the epic level of existing student loan debt. After home mortgages, this category of debt recently passed the $1 trillion mark and is now the second largest for Americans—more than credit card and auto loan debt. For many young Americans, a college education is still the best investment they can make for their financial future. But college tuition continues to rise, and the level of student loan debt is harming the US economy. The average student graduating from a four-year university accumulates $26,600 in student loans. The burden of debt has significant implications for an individual’s financial future. Paying off student loans cuts into a person’s ability to put money toward other purchases or investments, whether buying a car or house or saving for retirement. Not everyone graduates college with crushing debt. 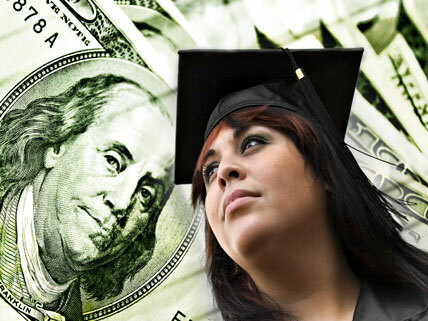 Only about 1 percent of graduates are in debt more than $100,000, and just one in ten owes at least $40,000. For many students their debt load is manageable assuming they get a good-paying job. But it can become a drag on their financial security, with a negative “multiplier” effect on the overall economy. According to one estimate, the existing $1 trillion in total student loan debt is costing the country four times that much in lost economic activity due to lower demand for everything from cars to first homes. And for an individual graduate, delays in making investments, especially in terms of home equity, magnify the losses over a person’s entire working lifetime. This article examines how student loan debt is undercutting the ability of young Americans to grow their net worth through savings, investment, and home equity. Graphs and diagrams are worth thousands of words; the variety of charts here tell the story of the student loan crisis affecting US households and some proposals to address it. Learn how the recent deal to cut interest rates for new student loans barely touches the real problem: the level of already-existing student loan debt. This analysis focuses on the negative effects on the wider economy of the massive student loan debt that now tops $1.2 trillion in the United States. This proposal links the student loan crisis to another topic in the news: the bankruptcy of Detroit. Student loans are becoming a much more worse option for those seeking a college education due to the debt they form.